Don Wildman and cipher expert David Oranchak. Host Don Wildman presented a basic overview of the Zodiac story and visited the four crime scenes. He also consulted with cipher expert David Oranchak. Wildman and Oranchak examined the Zodiac’s first coded message and the still-unsolved 340 cipher while discussing some of the killer’s methods as a cryptographer. During his tour of the Zodiac crime scenes, Wildman was accompanied by theorist Mark Hewitt, who also shared his theory that the Zodiac was Ted Kaczynski, the infamous “Unabomber” responsible for several bombings and three murders. Zodiac theorist Mark Hewitt and host Don Wildman at the Lake Berryessa crime scene. The episode promised a “new theory” regarding the Zodiac’s identity but Ted Kaczynski became a Zodiac suspect immediately after his arrest in 1996. Theorists Douglas Oswell and Michael Rusconi published a book about the possible “Zodiac/Unabomber connection” titled Dr. Zodiac, and others had promoted this theory over the years. The episode also included a brief recap of the theory that the Zodiac was Arthur Leigh Allen, the so-called “prime suspect” named in the books by Robert Graysmith and the 2007 film Zodiac. Retired San Francisco police Inspector Vincent Repetto joined Wildman at the scene of the Zodiac’s last known murder, the intersection of Washington and Cherry Streets in the Presidio Heights neighborhood of San Francisco. Repetto expressed his doubts that the Zodiac would be captured and said he believed the killer was most likely dead, but he also shared optimism that the case could be solved if new evidence was discovered or DNA identified the killer. Retired SFPD Inspector Vincent Repetto at the scene of the Zodiac’s last known murder. Gary Harmor demonstrates a method used to obtain DNA from old stamps and envelopes. The narrator stated, “The actual Zodiac evidence was collected in a state lab in May 2018 who then sent the DNA to a genealogical lab in Florida.” Previous news reports, comments from law enforcement sources, and internet rumors indicated that investigators were still waiting to hear if the lab could retrieve usable DNA evidence, but the narrator’s statement created the impression that usable DNA had already been obtained and had been sent to a lab in Florida to be used in forensic genealogy research to identify the Zodiac. The narration may have been a simple mistake as misinformation continues to create confusion about the status of the investigation. If the narrator was correct, then attempts to identify the Zodiac using forensic genealogy may be proceeding. Mysteries at the Museum also featured an unusual representation of the costume worn by the Zodiac during the attack at Lake Berryessa. 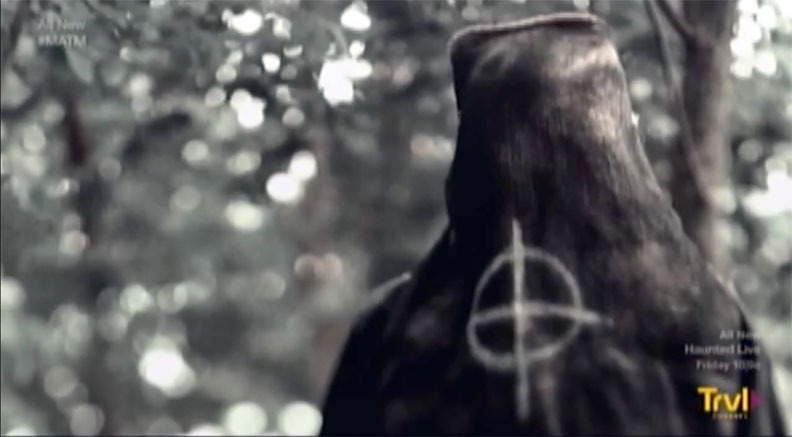 Unlike previous recreations, the actor portraying the Zodiac appeared to be wearing a large, narrowed black bag with a white crossed-circle over the chest. This version of the costume apparently had no eye-holes, meaning the Zodiac would not be able to see during the attack. The Zodiac killer as depicted by Mysteries at the Museum. 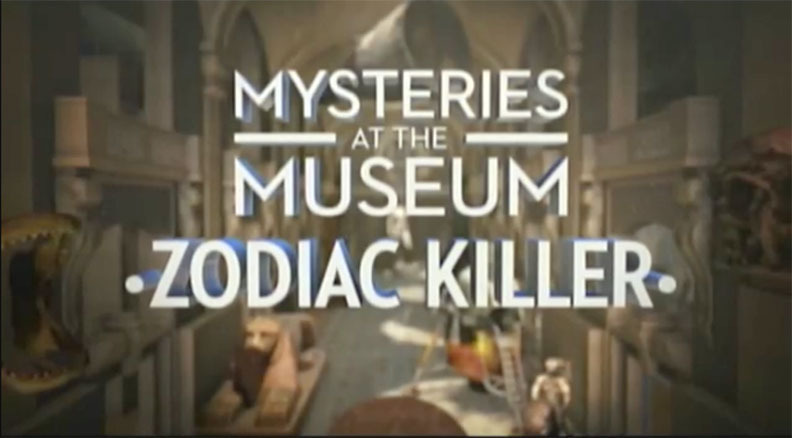 The Travel Channel will rebroadcast the episode Mysteries at the Museum: Zodiac Killer on Sunday, October 7, 2018, and on Wednesday, October 10, 2018. Check local listings for channels and show times, and CLICK HERE TO WATCH PROMOS FOR THIS EPISODE.